Emergency power cut-offs that were not working, slip-ups with new safety rules and a disclosure that some significant concrete work may be shoddy and need to be redone are among the new details in the latest series of federal reports on Metro. WASHINGTON — Emergency power cut-offs that were not working, slip-ups with new safety rules and a disclosure that some significant concrete work may be shoddy are among the new details in the latest series of federal reports on Metro. The Federal Transit Administration quietly released its May inspection reports Friday, along with a contractor’s oversight report for round-the-clock track work surges that lags a month behind. Among the issues highlighted below, the oversight report disclosed an internal Metro finding that significant work on concrete that supports rails near Rhode Island Avenue likely needs to be redone to hold up long-term. In an emergency, Metro workers or first responders are supposed to be able to cut power to the third rail with the push of a button, but the emergency trip stations on the platform at Brookland were broken in mid-May. Federal inspectors found that Metro crews were able to find the cause of the issue — the boxes’ power supply had been cut off. Metro had to pull 800 feet of new wiring from the Rhode Island Avenue power substation and use spare conductors to fix the issue. On the Orange Line, a single emergency trip station call box was falling apart above the Capital Beltway between West Falls Church and Dunn Loring in an area where rail power cables also were laying on the ground and several seals meant to keep dirt and grime out of power systems needed to be replaced. Near East Falls Church, a section of used rail was sitting dangerously close to the electrified third rail. Along the Red Line, “lighting condition ranges from extremely poor to nonexistent” between Forest Glen and Silver Spring, according to the report. Inspectors also noted water and mud pool around electrified cables in several areas including between Bethesda and Tenleytown where more water drips in from the tunnel ceiling. At Forest Glen, federal inspectors even spotted a leak from the ceiling dripping directly on top of the electrified third rail May 10. “The insulator located approximately 3-feet from this spot is melted to the ground. The third rail is not supported in this section,” an inspection report said, with a supporting photo. Also between Silver Spring and Forest Glen, an emergency catwalk is blocked by loose and exposed wires that could cause workers or riders to trip and fall if they had to evacuate through a tunnel in the event water sparked smoke or fire or there were another type of incident. Metro is in the middle of four straight weekend shutdowns between Friendship Heights and Grosvenor-Strathmore meant to test a seal that could cut down on the amount of water getting into tunnels, but the inspectors say Metro must still do more to clear mud and grime from drains and power cables in several parts of the system. On the Green Line between Fort Totten and West Hyattsville for example, several drains were clogged with mud and debris and there was standing water around the insulators supporting the third rail. The issues were noted in a regular inspection by a Metro contractor. Back on the Red Line near Takoma on May 20, a welded bar was holding two pieces of rail together even though it was not designed for the job, but that was not the most serious issue: One of the rails was moving up and down about 4 inches, which should have meant the track was taken out of service. Inspectors said that could require replacing rail ties, adding new ballast rocks to support the tracks and resurfacing the area. New safety procedures meant to keep workers from getting run over on the tracks are not always being followed. On May 10 at Forest Glen, the “advanced mobile flagger” who is supposed to speak directly to train operators to warn them of workers on the tracks ahead only began following the proper script after seeing a federal inspector was there, the inspector said. The train operator also failed to properly sound her horn and went faster than she was supposed to until she came up to the work crew. About a week later, federal inspectors ran a random check on the Red Line at Takoma and found the flagger there was not in the proper position and did not have the proper equipment. At White Flint, two trains failed to sound their horns and one of the train operators apparently did not even know about the new flagging procedure that had been implemented a few weeks earlier. “This train operator admitted that he did not attend the class and was unfamiliar with the permanent order,” an inspection report said. In at least 13 other cases federal inspectors saw across the system, train operators failed to properly sound their horns or sped over the limit when workers are present. The inspectors found a number of operators were not clear on whether they were supposed to use their train’s loudest horn or a quieter setting. In another case, a train operator said a flagger at Pentagon City wrongly told her the work crew was not on the tracks yet. While initial inspections of work in the area of the Green Line near Greenbelt that was shut down from April 15 to May 14 noted some problems, the final walk-through by federal inspectors raised no issues with the work. 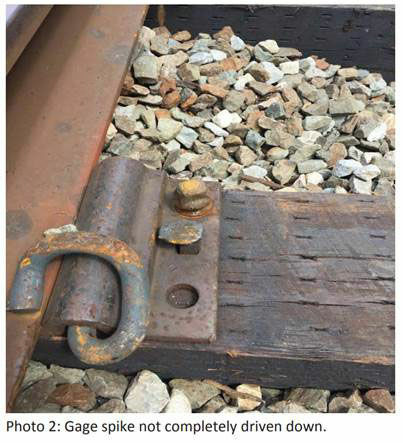 On May 1, inspectors found that some of the brand-new crossties had been split by bolts hammered in too close to the edge of the tie and that some other ties had spikes not driven all the way in. A follow-up May 13 found that the work generally looked good, including new brighter LED signals that replaced older bulbs. A Metro walk-through prior to the work zone found it was desperately needed, with at least 25 percent to 50 percent of crossties so badly deteriorated that they needed to be replaced immediately. “Deterioration of the cross ties has shown several signs of concern including 3rd rail insulators leaning/unsupported, twisting/warp of cross ties, hollow ties, and other issues,” a Metro quality control inspection found. Overall, a separate report compiled for the Federal Transit Administration projects work during Metro’s round-the-clock shutdowns this year cost about $484,297 per day. Added to the cost of work during single-tracking zones and other related projects, that would put the final cost of the 392 days around $159.4 million. Metro’s latest increase in authorized funding for the project brought the internal estimated total to about $151 million, including $12 million in short-term borrowing. According to the report, in the March 4 to April 12 work zone on the Blue and Yellow Lines, Metro’s internal quality control team found 99 items that needed fixes. Of those, 47 were fixed before the surge ended while 52 were not. The 13 most serious issues were all addressed before the tracks reopened, along with half of the 16 next-highest priority issues. An internal closeout report for that surge disclosed significant problems elsewhere: concrete repairs supporting tracks near Rhode Island Avenue. The federal oversight report cites an internal Metro report from December that found three types of defects in the concrete pads that sit directly under the tracks between Rhode Island Avenue and the Brentwood Yard that will allow water to break down the concrete over time. “A repair for these defects is required as soon as possible,” the internal December report said. While the FTA contractor responsible for the oversight report has asked Metro whether the repairs were made, the oversight report said Metro had yet to respond and the issue remains open. The FTA approved Metro’s project management plan for the surges on April 21, about two months before the Jun. 30 end of this round of surges. The next 24/7 work zone starts Saturday. Train backups and too many work crews out across the system in the middle of the day led to at least some workers simply standing around and waiting without any work getting done, inspectors said. On May 25, an inspection crew first asked to get onto the tracks at 10:47 a.m. only to be told to wait because too many other work groups were on the tracks. At 12:07 p.m., the rail control center radioed back for details and granted permission at 12:12 p.m., about an hour and a half after the request was first made. In order to do key parts of the inspections though, the crew needed additional protections on the tracks. When they reached one of those areas and asked for the permission at 12:25 p.m., they were told to wait again. At 12:51 p.m., the control center said train backups down the line meant it would be awhile before permission was granted. The worker in charge of the inspection group simply canceled the request and got permission for the group to turn around and head back to West Hyattsville since there would not be enough time to do the work in the midday track-work window. Metro plans to hire more staff for the Rail Operations Control Center to address changes made as far back as 2009, but training can be a long process. Federal inspectors in May generally praised improvements in Metro’s radio traffic to include more proper terminology and complete repeating of commands. The reports also cover positive work in rail maintenance yards including fixing and replacing seats and other repairs on railcars. In the shop, inspectors watched the changes to a pair of 6000 Series cars that will be used as Metro’s new “money train.” The train that usually goes through the system late at night under armed guard to collect the cash from fare card machines had been an original 1000 Series train since the system opened, but those cars are now being removed from service after more than 40 years. Among other changes to address the retirement of old cars and arrival of more new 7000 Series trains, Metro is also making changes to equipment that pulls derailed cars back onto the tracks so that it can accommodate the new trains. Inspectors said the changes are still undergoing an engineering review.